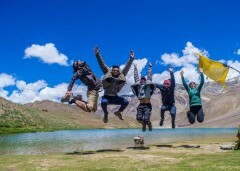 On this Spiti Valley trek, you'll visit the famed, crescent-shaped Chandratal Lake, trek to the world's highest post office at Hikkim, visit one of Asia's highest inhabited villages at Kibber and Komik and try your hand at spotting fossils at Langza. This 13-day adventure across the Spiti Valley also takes you to the village of Mudh near the Pin Valley National Park. Another highlight of the trek, you'll spend two nights in the monasteries of Komik and Key, where you can experience traditional Buddhist culture, and one night in tents pitched near the multi-coloured Chandratal Lake. To explore Spiti's gorgeous terrain, you'll combine 4 days of trekking with a road trip to visit destinations inaccessible via a trek. 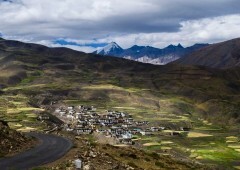 Spiti Valley, located in northern Himachal Pradesh, connects the neighbouring valleys of Lahaul and Tibet. With several important Buddhist monasteries spread all over the valley, it projects an interesting Indo-Tibetan culture. 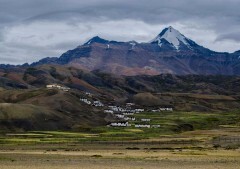 The small villages of the Spiti Valley, tucked away in the folds of imposing mountains, are brimming with hospitable people eager to showcase the beauty of Spiti to travellers from all over the world. Your 13-day Spiti Valley trip includes 4 days of trekking to the villages of Komik, Demul, Lhalung and Dhankar. On the remaining days, you'll travel in vehicles to visit Kaza, Langza, Mudh, Key and Chandratal. • Camp near the famous Chandratal Lake. • Stay in ancient monasteries of Key and Komik. • Visit some of Asia's highest inhabited villages. • Trek to the world's highest post office at Hikkim. • Visit Langza, the fossil village of India. • Stay at Mudh near the Pin Valley National Park. Travellers are required to follow instructions of the trek leader during the trek to Spiti Valley. 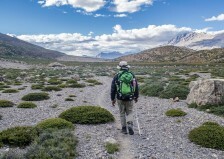 Consumption of alcohol, drugs and tobacco products like cigarettes is strictly prohibited during the trek to Spiti Valley. For cancellations made 7 days or more before departure of the Spiti Valley trek: 70% refund. For cancellations made 3-6 days before departure of the Spiti Valley trek: 50% refund. For cancellations made less than 3 days before departure of the Spiti Valley trek: no refund. You'll be picked-up from the Majnu ka Tila bus stop in New Delhi at 17:00 hrs on day 1 and dropped-off at the Majnu ka Tila bus stop by 11:00 hrs on day 13. For pick-up, you can select from three different timings on day 1: 17:00 hrs, 18:00 hrs and 22:00 hrs. Timings are approximate and may be subject to change or delays. You're required to carry a lunch box and a spoon with you to carry packed meals to have during the trek. A minimum of two travellers are required to book this 12-day trek to Spiti Valley. During this trek to Spiti Valley, travellers will visit destinations at altitudes from 9,000 ft to 14,500 ft and may experience altitude sickness, if not properly acclimatized. 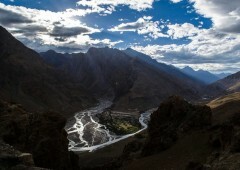 The tour operator reserves the right to cancel or alter the itinerary of the trek to Spiti Valley due to unforeseen circumstances such as bad weather or natural calamities. Travellers will be required to bear the cost of such changes to the itinerary. The tour operator takes utmost care to ensure safety of the travellers and shall not be held responsible for any mishap, accident or loss of life or property during the trek to the Spiti Valley. Arrive at the Majnu Ka Tila bus stand in New Delhi by your selected pick-up timing. You can choose to begin the journey to Manali at either 17:00 hrs, 18:00 hrs or 22:00 hrs. The AC Volvo bus will depart the plains of New Delhi, drive through the night and arrive in the mountains of Manali in the morning. Overnight in transit. The day is reserved for your body to acclimatize to Manali's higher altitude. You can spend the day at leisure. Visit the local marketplace for any last minute shopping, take small acclimatization walks or visit any local places of attraction in Manali. Overnight in a hotel at Manali. 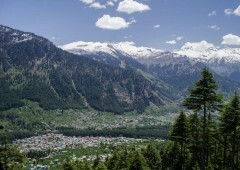 Spend a day in the lush, green landscapes of Manali. Today, you'll board private vehicles and begin your journey by travelling to Kaza, the capital of Spiti Valley. You'll drive across the Rohtang Pass, and cross a number of small river streams and rivulets. A small distance from the Rohtang Pass, the road forks with one heading to Ladakh and the other heading to Spiti. As you travel the road, you'll notice the landscape turning from green mountain valleys to barren boulders and hills. You'll take the one to Spiti and arrive at the town of Kaza by evening. Overnight in a hotel at Kaza. Visit secluded villages tucked away in deep corners of the Spiti Valley. Continue your journey across the Spiti Valley. Today's destination is the small village of Langza, but en route, you'll visit the village of Tashikang. A small community of 10 homes, the village, located on the boundary to the Kibber Wildlife Sanctuary, offers gorgeous views of the Chau Chau Kang Nilda peak, the highest peak of Spiti Valley at over 20,500 feet above sea level. Continue onwards to Langza, the fossil village of India and the subject of several documentary films. Overnight in a homestay at Langza. Today marks the first day of your trekking adventure. Beginning from Langza, you'll embark on a 6-hr trek to the village of Komik, the highest village in the world at over 15,050 feet above sea level. En route, you'll cross several small rivers where you can stop and refill your water bottles. Halt at the village of Hikkim around lunch time to visit the world's highest post office and have a packed lunch. Resume trekking until you arrive at Komik, and head straight for the Komik monastery. Overnight in a monastery homestay at Komik. 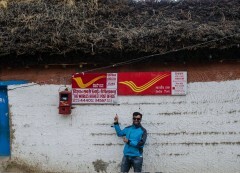 Trek to the world's highest post office at Hikkim. Wake up early in the morning. Today, you'll trek to the village of Demul. Located at a 5-hr trekking distance away from Komik, Demul is famous for its artistic handicrafts made by the local residents of Demul. Throughout the day's trek, you'll glimpse the majestic peak of Chau Chau Kang Nilda. Overnight in a homestay at Demul. Trek over narrow, mountain trails from one village to another. On the trail to Lhalung, you'll embark on a 3-hr trek on an entirely descending route, making it one of the easiest treks of the trip. The monastery at Lhalung, one of the oldest in Lhalung, houses a tree believed to have been blessed by divine powers with magical, medicinal properties. Overnight in a homestay at Lhalung. Begin the day's 6-hr trek from Lhalung and head to the village of Dhankar. En route to the village, you'll visit the lake of Dhankar, where snow leopards have been sighted by local residents a number of times. You'll also visit the old monastery at Dhankar, perched on a mountain slope providing a great vantage point for panoramic views of the Spiti valley. Overnight in a homestay at Dhankar. After four days of trekking in the valley, you'll board a private vehicle from Dhankar and travel to Pin Valley, the base camp for higher treks to Pin Bhaba and Pin Parvati. You're destination on the 3-hr drive from Dhankar is the small village of Mudh, located on the border of the Pin Valley National Park. 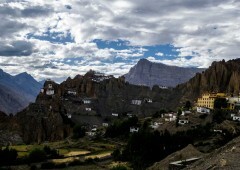 En route, you'll stop at Tabo to visit the local monastery, one of Spiti's most important centres of learning Buddhism. Spend a few hours at Tabo and visit the monastery's extensive library on culture and philosophy. Overnight in a homestay at Mudh. Today, you'll continue exploring ancient Tibetan architecture at Buddhist monasteries by visiting the Kungri Math monastery and the Key monastery. The lesser known of the two, the Kungri Math monastery, in the village of Gulling, is a school for young monks. Key monastery, arguably the most popular monastery in Spiti Valley, is perched atop a hill offering sweeping views of the Spiti River gushing across the valley. Spend an hour or two at each monastery, breathing in the incense and admiring the paintings and sculptures. Overnight in a monastery homestay at Key Monastery. Stay at the 1000-year old monastery of Key. Today, you'll travel to the crescent-shaped lake of Chandratal. En route, you'll visit the Kibber village, the base camp for higher treks to Parang-La and Kanamo peak. You'll also take a brief halt at the village of Batal to stretch your legs and rest. You'll arrive at the Chandratal campsite, located a short distance away from the actual lake, by evening. Overnight in tents at Chandratal campsite. 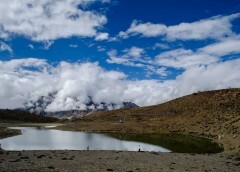 Trek to the multi-coloured Chandratal Lake. Early in the morning, you'll head out from your campsite and begin the short, 1-hr trek to the Chandratal Lake. After arriving, spend some time admiring the multi-coloured lake, click some photos, dip your feet in the lake's cool, blue water and return to the campsite. From here, you'll board vehicles for the drive to Manali. The 4-hr drive ends by late evening at Manali, where you'll bid farewell to your fellow travellers and board the bus back to New Delhi. Overnight in transit. You'll arrive back in New Delhi by 11:00 hrs. Your trip ends here. Personal expenses such as extra meals or beverages, tips to staff etc. Costs due to unforeseen circumstances such as road blocks, natural calamities, etc. You'll be picked up from New Delhi and travel to Manali in a shared, AC Volvo bus. You'll spend the night in the bus. Since no meals are provided today, you'll want to carry some dry snacks like chocolates and biscuits with you. Spend the day at Manali. You'll be accommodated in a hotel at Manali. Since no meals are provided today, you'll want to visit any of the restaurants in Manali to taste the local cuisine at your own expense. You can also visit the local marketplace at the famous Mall road to shop for any last minute essentials. Drive from Manali to Kaza. You'll be accommodated in a premium hotel at Kaza. Today's meal package includes lunch and dinner only. You can have breakfast at your hotel in Manali at your own expense. For lunch, your vehicle will halt at the village of Batal. Overnight in a homestay at Langza. 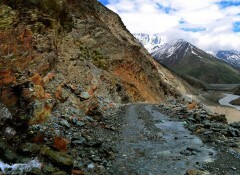 Drive from Kaza to Langza via Tashikang. You'll be accommodated in a homestay at Langza. Accommodation will be on twin-sharing basis, but may be changed to triple-, quad- or multi-sharing basis depending on availability and group size. Today's meal package includes breakfast, lunch and dinner. Overnight in a monastery homestay at Komik. Trek from Langza to Komik via Hikkim. Throughout the trip, you'll be accompanied by an experienced trek leader and a support staff of helpers. You'll be accommodated in a monastery homestay at Langza. Today's meal package includes breakfast, lunch and dinner. For lunch, you'll halt at the village of Hikkim. Overnight in a homestay at Demul. Trek from Komik to Demul. You'll be accommodated in a homestay at Demul. Today's meal package includes breakfast, lunch and dinner. For lunch, you'll carry a packed meal to have at lunch time during the trek. Please make sure to carry a lunch box and spoon to carry your meal with you. Overnight in a homestay at Lhalung. Trek from Demul to Lhalung. To ensure a good experience, make sure to carry good quality, water-proof trekking shoes with ankle support. You'll be accommodated in a homestay at Lhalung. Today's meal package includes breakfast, lunch and dinner. For lunch, you'll have a hot meal after arriving at Lhalung. Overnight in a homestay at Dhankar. Trek from Lhalung to Dhankar. You'll also trek to the Dhankar Lake. You'll be accommodated in a homestay at Dhankar. Today's meal package includes breakfast, lunch and dinner. For lunch, you'll carry a packed meal to have at lunch time during the trek. Overnight in a homestay at Mudh. Drive from Dhankar to Mudh village in Pin Valley via Tabo. All ground transport will be in a Tempo Traveller or Innova, depending on availability and group size. You'll be accommodated in a homestay at Mudh village. Today's meal package includes breakfast, lunch and dinner. Overnight in a monastery homestay at Key Monastery. Drive from Mudh village in Pin Valley to Key Monastery via the Kungri Math gompa. You'll be accommodated in a monastery homestay at Key Monastery. 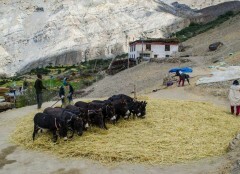 A monastery homestay is a basic accommodation facility operated by the monastery itself. Today's meal package includes breakfast, lunch and dinner. Overnight in tents at Chandratal campsite. 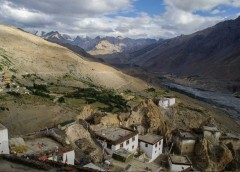 Drive from Key Monastery to Chandratal campsite via Kibber. You'll be accommodated in premium tents with attached washrooms at the campsite. Today's meal package includes breakfast, lunch and dinner. For lunch, your vehicle will halt at the village of Batal. Trek to visit the Chandratal Lake and drive from Chandratal campsite to Manali. Board the AC Volvo bus back to New Delhi. You'll spend the night in the bus. Today's meal package includes breakfast and lunch only. You can have meals at any of the restaurants in Manali at your own expense. You're bus arrives in New Delhi by 11:00 hrs, subject to traffic conditions. Your trip ends here. New Delhi is well-connected to major cities via flights to the Indira Gandhi International Airport and trains to the New Delhi Railway Station. The pick-up point is located 25-km/2-hr drive from the airport and 12-km/45-min drive from the railway station. 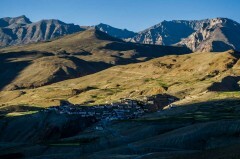 The tour operator will arrange your transport to the start point of this Spiti Valley trek.